It has become hard to imagine that Padstow was once just a fishing village on the North coast of Cornwall. Thanks to high-profile chefs like Rick Stein and Paul Ainsworth, Padstow has become one of the top foodie destinations in the UK. Together, Stein and Ainsworth have six eating houses scattered around the village. Paul Ainsworth has two: his Michelin starred restaurant No. 6 and an Italian restaurant called Rojanos in the Square. Paul Ainsworth (b. 1979), who has trained in the kitchens of British legends Gary Rhodes, Gordon Ramsay and Marcus Wareing, opened No. 6 in 2006. The restaurant is run by a small team of young and enthusiastic people. Working together with executive chef Paul Ainsworth are head chef John Walton and Alex Tozer, restaurant manager and sommelier. My last visits to the restaurant had been in May 2011 and December 2011. The next year, in September 2012, No. 6 was awarded its Michelin star. Paul Ainsworth commented: "A Michelin star is something I’ve always dreamt of as a kid; for every chef I’ve ever worked for, that was the point to prove you were cooking good food. There are lots of other lists and guides but Michelin has always been a super-special guide to me." No. 6 is open lunch and dinner Tuesday till Saturday. The restaurant offers an a la carte menu, a 'little 6's' menu (small dishes priced between £5 and £9), a vegetarian menu and there's a set lunch menu (2 courses £19, 3 courses £25). I had lunch at No. 6 with my husband and two friends on Friday 19 July 2013 and we all chose dishes from the a la carte menu. 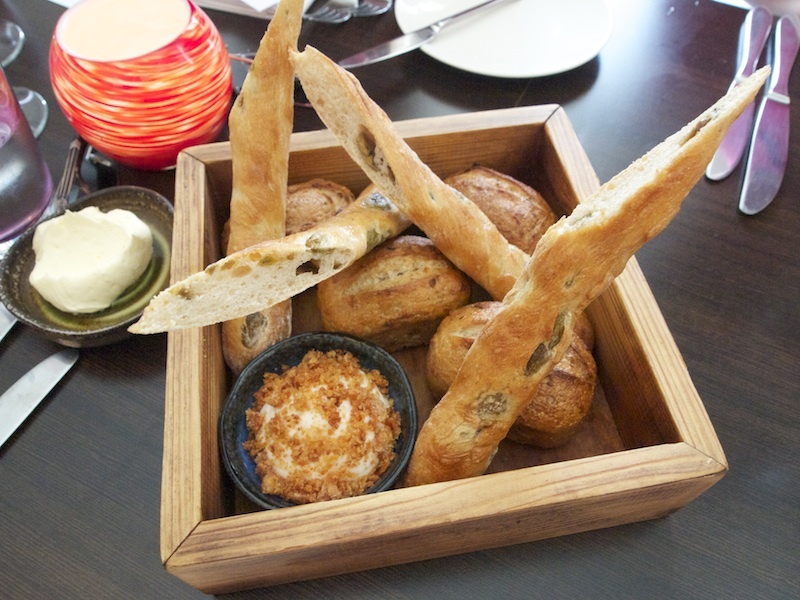 First to arrive was a wonderful selection of home-baked breads, served with a creamy smoked cod brandade sprinkled with pork crackling, and some whipped Cornish butter. 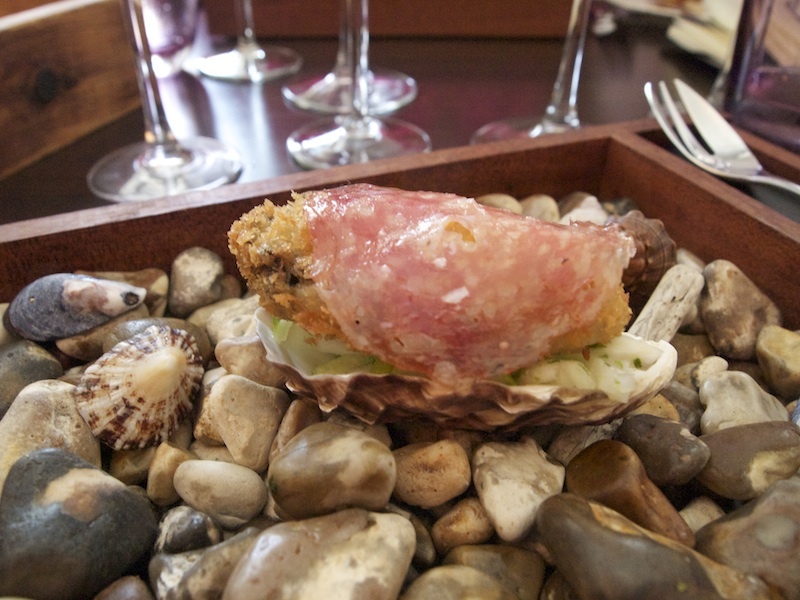 The a la carte menu features, as a starter Porthilly oysters with fennel, Granny Smith apple and salami. We had asked the restaurant to serve us one each as an amuse bouche. A deliciously warm and juicy breaded oyster, served on top of julienne-cut crisp green apple and fennel and topped with a thin slice of salami. A lovely, elegant dish with great textures and a nice balance between richness and freshness. Cornish Duck followed. Terrific tagliatelle that had a hint of saffron, served with crumbled, salty fettle (Yorkshire feta cheese) and smoked almonds. 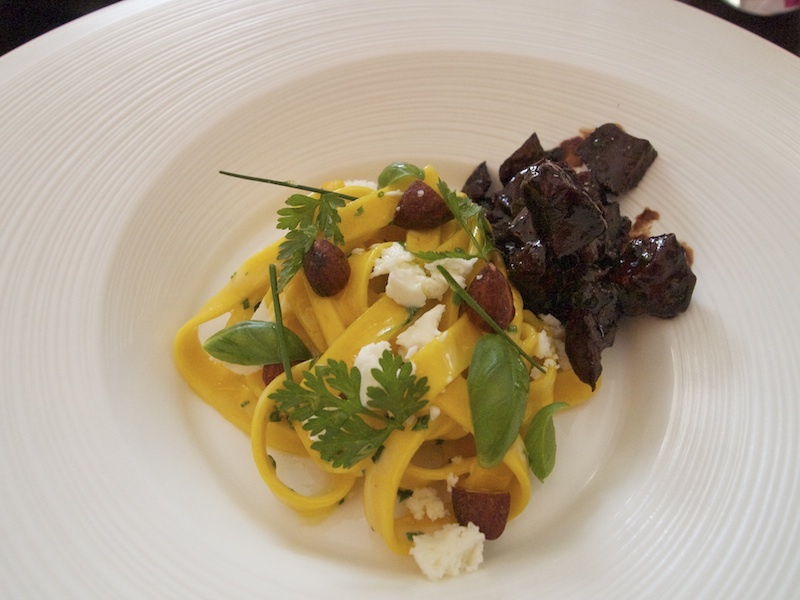 With the pasta came a rich and succulent duck ragu with wonderful dark and smoky flavours, served in a seperate bowl. A well-executed dish with lovely, balanced flavours, the feta complementing the duck nicely. Next up was a slice of beautifully browned and gooey pig's trotter, with a very flavoursome ham hock filling that had been seasoned with capers, parsley and shallots, garnished with finely grated truffle and a few drops of PX Sherry dressing. On top of the pig's trotter were some fresh peas, a Bramley apple puree and a fried quail's egg. The ham hock added a wonderful lightness to this rich dish. A lot of work had been put into it and it clearly showed on the plate. 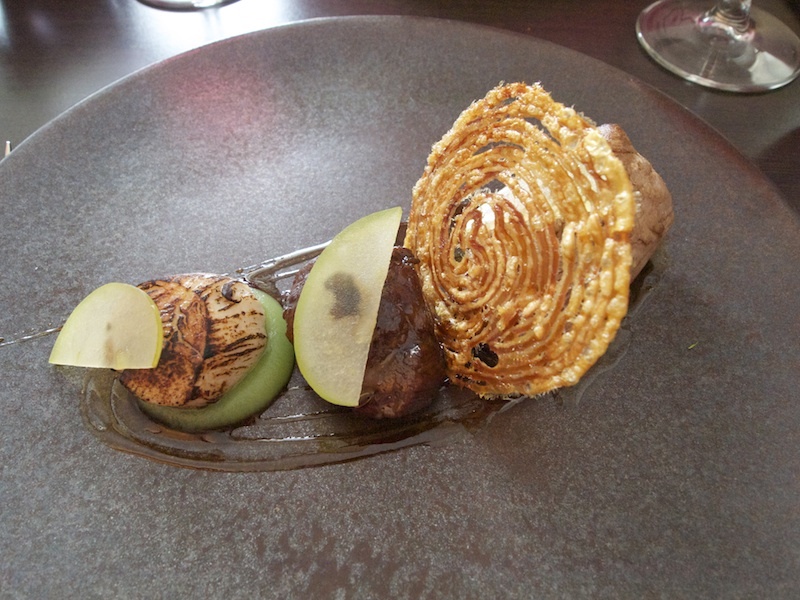 My main course was Cornish Saddleback pork, 'hazelnut' summer, crackling, scallop, cider apple. Lovely pink and moist pork tenderloin, a piece of tender pork cheek and a fantastic, thin, crackling wafer. Also on the plate were beautifully caramelised sweet scallops, placed on top of some sharp and clean-tasting apple puree. The 'hazelnut' summer came in a small bowl and was comprised of peas, broad beans, baby carrots, beetroot and hazelnuts. A handsomely cooked and elegant pork dish; the pork tenderloin could have done with a bit more sauce however. Dessert was a great dish called 'Strawberry Breakfast'. 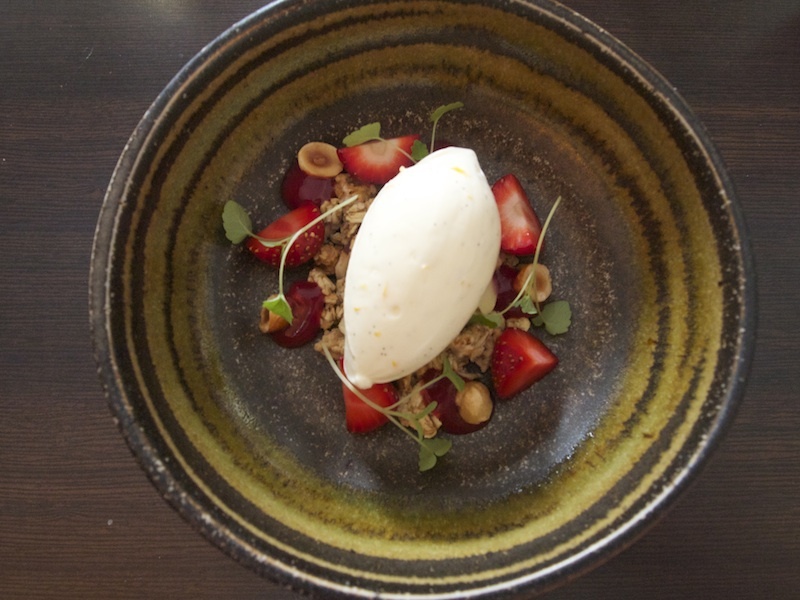 A divine strawberry cheesecake ice cream, served with fresh strawberries, a wonderfully toasty and crunchy hazelnut muesli and some strawberry coulis. Even better was the second dessert (which the four of us shared). An absolutely brilliant bread and butter pudding, that had a terrific caramelised top-layer and was deliciously soft on the inside. A small glass of chocolate 'beer' and some vanilla ice cream was served on the side. 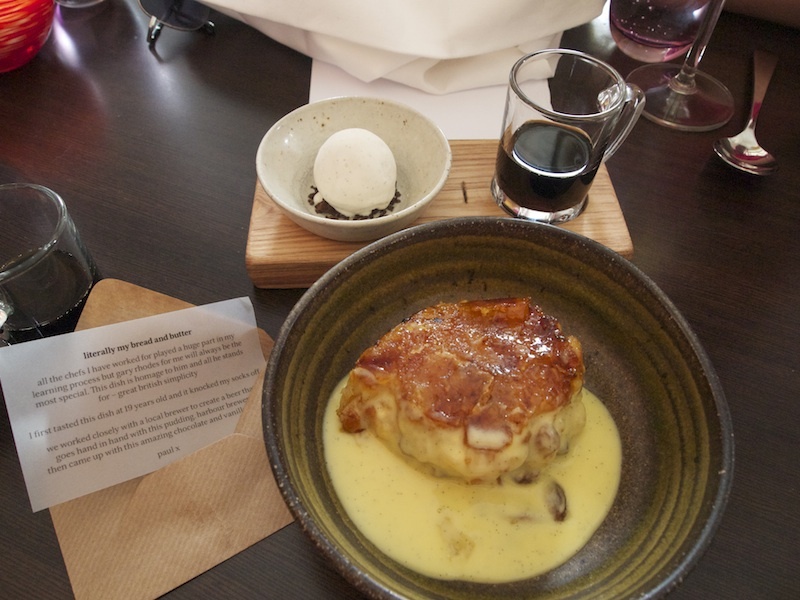 With the dish came a note explaining that this bread and butter pudding is an homage to Gary Rhodes, one of the chefs Paul Ainsworth worked for during the early years of his career. This was an excellent meal and an excellent dining experience. Under the leadership of the energetic and knowledgeable Alex Tozer, the service is one of the strengths of this restaurant, warm and welcoming. 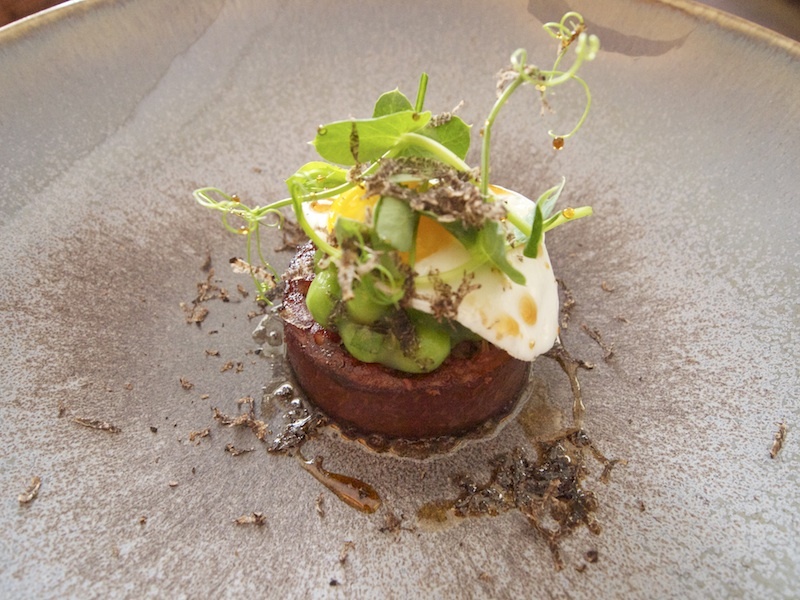 Compared to my previous visits in 2011, Paul Ainsworth's cooking has grown in focus and attention to detail, resulting in incredibly satisfying dishes. He likes to cook unpretentious food and he does just that. But make no mistake, unpretentious doesn't mean rustic or straightforward at this restaurant. Dishes are created with ingredients that are more or less on his doorstep and everything is carefully executed. The no-frills presentation really puts the spotlight on the main ingredients. Something tells me Paul Ainworth's culinary journey is far from over and that we may expect many more exciting things from this talented and creative chef.